This is the debut volume of the Matsui Fuyuko in 2002. Seemingly since this work title is used for the subtitle of this exhibition, this work is a work with intensity strong also for her. The art museum assigned one booth for exhibition of this work. The art museum built the space into which this work goes entirely. So, the appreciation person can confront each other from a work and the front in a booth. I was actually able to face to this work alone in the inside in the state where it was made leisurely. I received the strong impression in the size of this work, and the force of the detail closely drawn with fine workmanship then. I describe this later. This is the Matsui winter child's feature which I consider first. She constitutes a work like Western modern pictures, and draws by the technique of a Japanese painting. The painter of a classic Japanese painting values the blank which nothing draws. He gives a spatial spread to pictures by utilizing this blank. 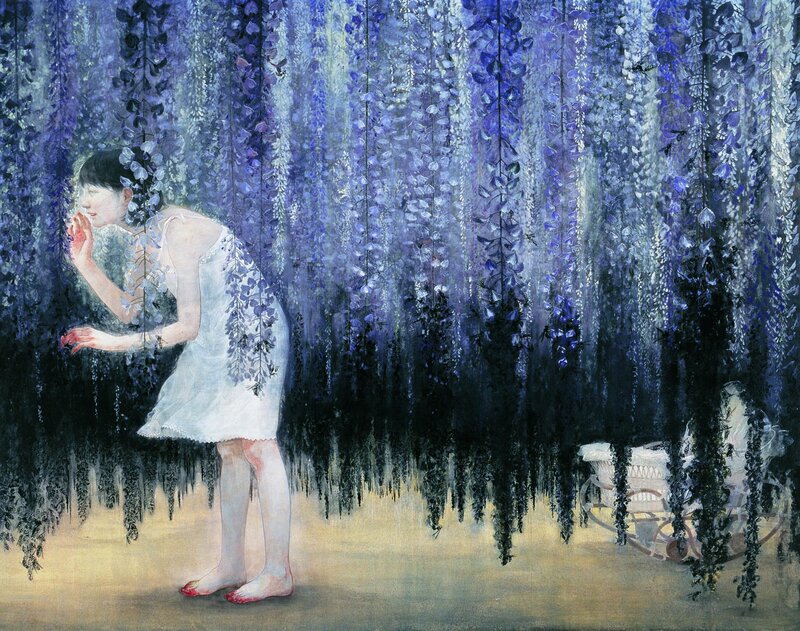 Matsui hardly makes a blank with a characteristic Japanese painting in this work. She draws countless Fuji's flower instead of being blank. Fuji's flower which she drew has filled 90 percent of the area of this work. What those who look at this work are reminded of from this is the dense closed space characteristic of Western pictures. However, you will find out the feature which is not in Western pictures in this work, when you look at this work. You will be overwhelmed by the force of a picture at a glance, if you look at matiere oil painting which drew and was crowded with the same concentration in the same size as this work. It is force to the extent that he cannot breathe, either. You will be overwhelmed by the force of the work if you look at the great work of a baroque term like Rubens's religious painting. However, when you look at a mural painting thoroughly, you should notice that it is so rough that the details of the work are unexpected. In the usual case, you do not notice the roughness of the details Rubens's great work. That is because you will be overwhelmed by the force of a great work and will not look at it in details to details. You will appreciate a work thoroughly to details at the same time you feel force for the size of a work, when you look at this work of Matsui unlike such Rubens's religion work. The two reason exists. One of the reasons is paints which she is using for the work. She is using the paints of the Japanese painting. It seems that there is no materiality which the paints of the Japanese painting resemble the watercolors of Western pictures, and accumulates paints on canvas, and it dyes paper by a color. Therefore, if a painter uses the paints of a Japanese painting, paper will be permeated or it will flow. Therefore, it does not carry out the painter of a Japanese painting building a concept beforehand and drawing just like that. Because, even if it tries to draw a picture as he is a concept, the paints to be used do not function on up to their expectations. Therefore, the painter of a Japanese painting draws a picture improvisatorially using paints permeating or flowing. Therefore, those who look at such a Japanese painting do not think the construction nature of the whole work as important. They find whether the painter did skillful use of the portion he paints permeated or flowed, and it made the beautiful work. The paints of the Japanese painting are used with this work of Matsui. The second of reasons is the light color of paints. Since the paints of a Japanese painting become a solid like an oil-painting implement and do not become hard, they become color light. When you look at this work, you find neither primary color glaringly vivid brightness nor the tense relations of colors. For the above two reasons, when seeing this work, the なた can see a work thoroughly to details, even if overwhelmed by the size and force of a work. However, I do not want to tell this work that force is insufficient. It is one of the features of this work. When you look at this work, you can also feel force like Rubens's Daisaku, and you can also be simultaneously impressed by them, being able to see the details of this work thoroughly. According to Matsui's history, she began to study oil painting and changed into the study of the Japanese painting behind. The feature of her work explained here may originate in her history. When you look at this work by Matsui, even if overwhelmed by the size and force of a work, a work can be thoroughly seen to details. 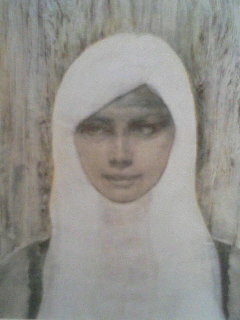 I said that this is the feature of this work by Matsui. It is intentional that Matsui gave this feature to this work. Matsui had a reason which should do so. Matsui wanted people to look at the details of this work thoroughly. Where were the details in which Matsui wanted what people see thoroughly? The details which Matsui wanted to show to people are the flower and something that are obstinately drawn on a background finely in a work and that were crowded. When you often look at a screen, it turns out that Fuji's flower is drawn. However, you notice light purple becoming blackish as you turn the look to the lower one. You will think that the black may be a shadow. Then, you will notice black having an outline clear one by one as a thing, if eyes are elaborated. The black was signs that the bee of hundreds of animals and thousands of animals had extorted from the flower closely. You will think it uncanny that he notices that at last. By the way, those who look at this picture will not regard the portion of the background of this picture as a background, supposing Matsui draws this work by oil painting. The bee extorted from such much Fuji's that canvas is filled flower and flower is drawn minute, and the portion has too strong presence for using the background of a picture. You will find many bees first, supposing you look at this work drawn by oil painting. Then, you do not feel eeriness for which it presses gradually. When you look at this original work, you should notice the background of this work becoming blackish from light purple first. Then, you will think that you are strange and will gaze at a portion like the black mist under a background. And when you stare at this work, you notice that black mist is many bees gradually. You feel uncanny fear just because you discover the group of a strange bee through such a process. On the other hand, she will do whether a background is omitted by drawing some Fuji's flowers and bees symbolically except it like light purple mist, supposing Matsui draws this work in a classic Japanese painting. In a classic Japanese painting, a painter does not draw a background obstinately like this work. When you look at this work drawn as a classic Japanese painting, you do not feel the concrete eeriness that there are thousands of bees. Matsui uses properly and united the feature of oil painting, and the feature of the classic Japanese painting in this work. As a result, this work gained uncanny force and grotesqueness by that. I adhere to the background in this work. Matsui drew the flower of Fuji, and the group of the bee on the background without the crevice in this work. As a result, she hid the background of this work like curtain, and has lost unfilled space. This means that depth was omitted in this work. You have a field of view restricted and will feel a cooped-up feeling, when you look at this work. By the way, the title of this work says, "Becoming Friends with All the Children in the World", and you will hear this title and will imagine a spread. You can also hold the image to which the child in the world and the link of a friend develop all over the world from the title of this work. If you look at this work with such image, you not only cannot feel a spread for a work, but will feel a cooped-up feeling. Because you see the depth of a work hidden. Depiction has betrayed the image of which it is reminded from the language of a title. Those whom that looks at are made to stir up sense of incongruity. The effect of giving a shock of sense of incongruity is a kind of dissimilation. The technique of stirring up dissimilation was utilized by the pictures technique of surrealisme. The artist of surrealisme started the alienation effect from the chain of the image of language by the technique of automatisme, and made the work. For example, Rene Magritte who is one of the typical painters of surrealisme gives some shocks of being strange to those who look at a work by showing what shifted common sense one step partially. People's common sense formed by means of language is the requisite for the shock. People do not have doubt at all to the common sense that this is such things originally. When you look at Magritte's picture, you interpret the contents drawn on the picture by means of language, and compare with your own common sense. As a result, you are met by sense of incongruity. 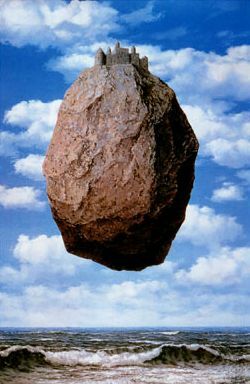 Magritte made full use of a technique in order to change into such a state those who look at a picture. For example, he did not try to draw the work filled by force which causes an excessive pictorial image. Instead, the pictures which are easy to interpret by means of language were made. The pictures which are easy to interpret by means of language are the solid pictures which consisted of required images. Therefore, the pictures which Magritte drew have neither thickness like the design of an illustration, nor presence. Matsui's work is the same as this. Therefore, Matsui chose the form of the Japanese painting which does not push forward presence. Furthermore, Matsui obtained the result of not making existence assert strongly by choosing light color in this work. A module is a concept on industrial engineering. For example, when Japanese automakers produce a car, these produce many kinds of vehicle types simultaneously in one factory line. They will make a chassis and parts in common, in order to perform this efficiently. And they make the difference in a vehicle type bring forth by distinguishing only a body design and some parts. They have carried out the difference in how to construct parts to the difference in a vehicle type. Then, they have made hard for them to also have lessened the kind of parts and to have reduced cost, when a car produced however, to make the product which individuality projected by having adopted such a system. And the automaker of Newly Industrializing Economies can imitate a Japanese automaker easily by adopting this system. Then, the automaker of Newly Industrializing Economies caught up with the Japanese automaker violently. Now, this work of Matsui is superficial like the illustration of a design. At a certain point, this resembles Magritte's pictures. Matsui has standardized like a platform each part article currently drawn in this work. She is not neglectful. It is the opposite thing. Intentionally, in the background of this work, she does not draw each flower and bee of Fuji so that it may be filled independently to presence. If she does such a thing, this work will overflow with Fuji's flowers and bees. If you actually look at this work of Matsui, you will notice each Fuji's flower and bee carefully drawn in this work. In this work, each Fuji's flower and the presence of the bee are thin. If you see this work by a distant view, you will not notice each Fuji's flower, or a bee existence. However, you approach a work, and if it often looks at, you will notice existence Fuji's flower and a majority of bees, and will be surprised. At the time, you imagine the first writer's to draw each fine bee and Fuji's flower vindictive figure, and receive strange impact. The character of the impact which you receive is not the external touch that is seen and is understood immediately but a thing which becomes clear gradually. As a result, you have a deep impression which you do not forget till the future in this work.